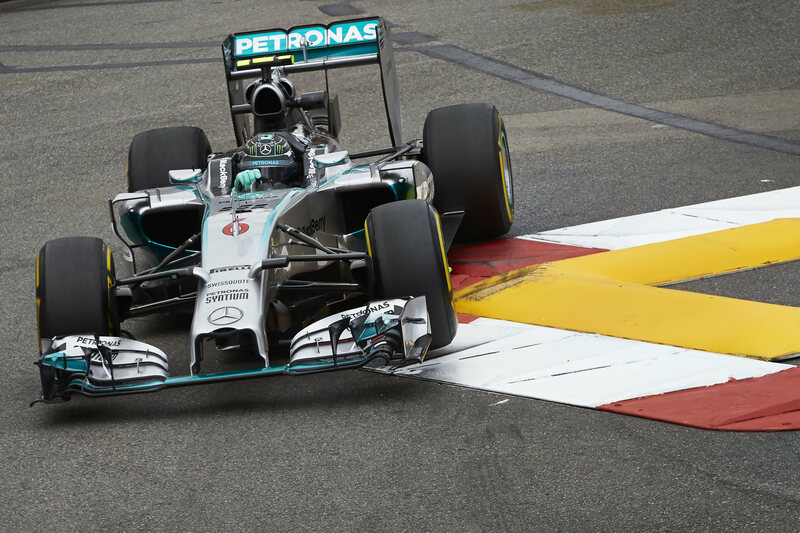 Nico Rosberg beat Lewis Hamilton to pole at the Belgian Grand Prix this afternoon, marking his fourth consecutive pole position. This time around Hamilton had no mechanical failures to blame or excuses to make as to why he couldn’t beat his team-mate, giving Rosberg fodder in the series of mind-games that Hamilton started in May. Sebastian Vettel was the best of the rest behind the Mercedes front-row, with Fernando Alonso and Daniel Ricciardo flanking him. The Marussia men were the first to brave the track this afternoon and were followed out by the Caterham and Toro Rosso drivers. Following a heavy hail storm fourty minutes before Qualifying the track was wet and the drivers fitted the Intermediate compound to their cars. The surface water proved too much for the lighter wet weather tyres and drivers struggled for the first few laps as Hamilton, Magnussen, Bottas and Vettel all went off track at the bus stop chicane, while Felipe Massa skipped over the kerbs following a lock up at turn 7. Impressively, Hamilton went off track at the last corner but still managed to set the fastest lap. Esteban Gutierrez had no issues in the wet but he was helpless as his car gave up and forced him to pull over at turn 15 halfway through Q1. The track was relatively dry by the time the first part of Qualifying drew to an end, but Maldonado was still caught out by the conditions and spun under breaking at the bus stop chicane, forcing Vettel to take evasive action. Maldonado recovered under yellow flags but his second attempt was not enough to clear him from the drop-out zone and he qualified seventeenth. Nico Hulkenberg was a surprising drop-out in eighteenth, ahead of Max Chilton and Esteban Gutierrez. Kobayashi stand-in Andre Lotterer outqualified full-time driver Marcus Ericsson by a full second on his F1 debut. Jules Bianchi made it through to Q2 but was in no rush to get out on track, while Romain Grosjean lead Adrian Sutil out. Perez came out and was warned that, as rain was expected, his first lap could be his quickest. As such, all the opening laps were important, but both Romain Grosjean and Jules Bianchi spun at turn 1 on their first attempts. Nico Rosberg headed Fernando Alonso and FP3 leader Valtteri Bottas after their respective first laps, but when Hamilton came around on his second attempt, he was quicker by a full second. The Toro Rosso drivers gambled by delaying going out but this proved fruitless as both drivers failed to make it through to Q3, Kvyat qualifying eleventh ahead of Vergne in second. Jenson Button narrowly slipped into the top ten in the final seconds, and Perez’s quest to promote himself and knock Button out failed as the Mexican couldn’t better thirteenth. Adrian Sutil made it out of Q1 and qualified fourteenth while Romain Grosjean finished just ahead of Jules Bianchi who will start tomorrow’s Grand Prix in sixteenth. Q3 begun and brought the fight for pole. Hamilton was the first driver to start a flying lap but immediately went wide at Saint Devote and caused a loss of 1.6s over team-mate Nico Rosberg who was behind him. Rosberg crossed the line three seconds ahead of Sebastian Vettel, who took provisional second, while Hamilton backed off to save his tyres and recorded a lap six seconds slower than Rosberg. Alonso’s first lap brought him to third, Bottas’ gave him fourth and Massa went fifth after his first effort, although Ricciardo, Button and Magnussen all jumped him in the following minute. Raikkonen was the last man to record a lap and went fifth, behind Alonso. Hamilton came around for his second attempt at securing provisional pole but could only go second, 0.7s behind Rosberg. Vettel was the first man to set a lap on a second set of tyres and improved slightly but stayed third. The track was now drying, suggesting that the last man across the line could have an advantage. Hamilton was one of the last to start his lap but lost temperature in his brakes in his efforts to give himself some free space and subsequently went slightly wide at turn 1. Hamilton improved his time by four tenths but couldn’t get near to Rosberg who also improved him time, qualifying three tenths ahead of his team-mate. Daniel Ricciardo had a very close call after going wide at turn 19 and saving himself from a huge accident while flying over the kerbs, but his commitment was only rewarded with fifth. His team-mate Vettel was the best-of-the-rest behind the Mercedes men while Fernando Alonso finished fourth. Valtteri Bottas was sixth, a disappointing result from the Finn who tends to shine in wet conditions, while Magnussen fended off Raikkonen for seventh. Felipe Massa qualified ninth while Jenson Button rounded out the top ten – another disappointing result for a driver who excels in mixed conditions. The 1991 Formula One season is remembered by many for several different reasons – such as the legendary Ayrton Senna snatching the third of three World Championships, Michael Schumacher’s Grand Prix debut and Martin Donnelly suffering his career-ending crash at the Circuito de Jerez. Personally however, 1991 stands out to me as the season that Eddie Jordan made the huge leap from F3000 into the world of Formula One. Admittedly, the first season was nothing ground-breaking but it does boast the unique achievement of giving Michael Schumacher his F1 debut. Although Schumacher could have helped Jordan to the highest of heights in what would be an even more impressive story than the rags-to-riches tale of Red Bull Racing, Schumacher merely competed at the Belgian Grand Prix with Jordan before leaving the team for Benetton. Overall, 5th place in the Constructors Championship wasn’t bad for a team still finding its feet. 1992, on the other hand, yielded but one point and an eventual eleventh in the Championship. Nine finishes between two drivers out of sixteen races was a shocking fall to earth for the same team who had hit the ground running in ’91. And while a ‘glass-half-full’ kind of guy would say that Jordan’s performance in ’93 was triple what it was in ’92, a mere three points was not the performance boost the team was looking for as they settled for tenth place in the Championship. While Eddie Irvine served a three-race ban for causing a huge crash at the 1994 Brazilian Grand Prix, his team-mate, Rubens Barrichello, brought a much-needed first podium to the team at the Pacific Grand Prix. However, Barrichello’s euphoria was followed immediately by a near-fatal crash at the San Marino Grand Prix. To his credit though, Rubens came back fighting and finished in the points four more times throughout the season while Irvine took a top-six finish three times. All-in-all the team were back on track with 28-points and fifth in the Championship to prove their progress. Eddie Jordan reshuffled his cards and brought Ralf Schumacher and Giancarlo Fisichella to the team for the 1997 season in the hopes of finally claiming a win. Schumacher’s first podium in F1 came at the Argentinian Grand Prix but came amidst six retirements out of seven races. However, the young German showed talent and when the car made it to the finishing line, Ralf scored points in all but one race. Fisichella wasn’t as regular in the points but took the team to two podiums, and set the team’s highest finish of second. Taking fourth in the Championship, it was clear to see that Eddie Jordan’s team were slowly, but surely, crawling towards that first win. But my god was it a surprise when it happened. Damon Hill, following Michael Schumacher’s example, won the World Championship and immediately left Williams for a slower team. He arrived at Jordan, probably expecting to pick them up and push them to the front, but was instead met with four retirements, a disqualification and five non-points finishes before finally scoring a point at the eleventh race. Ralf Schumacher, meanwhile, had nine races before making it to the points. It signaled that maybe the win was just out of their reaches, yet again. I suppose when you think about it, they were extremely lucky. As I’m sure you’ve probably seen on YouTube umpteen times, the start to the Belgian Grand Prix in ’98 was a complete mess. The race started in borderline doomsday rainfall which left the drivers’ vision greatly impaired, so when David Coulthard spun his McLaren, a huge pileup was inevitable. Thirteen cars were wiped out with four failing to make the restart more than an hour later. At the restart, a further two cars were taken out on a first corner crash. Through the chaos, the yellow of the Jordans shone bright and eventually both cars were on the podium – second and third. Michael Schumacher was leading the race by well over half a minute, but when attempting to lap David Coulthard, DC slowed down but failed to move off the racing line. As a result, Schumacher slammed straight into the back of the McLaren and was, naturally, out of the race. Through an incredible sequence of events, Jordan led the Grand Prix. With the grid behind them still braving the elements, various other crashes and spins saw the final tally of drivers finishing the race reduced to a mere eight. Nonetheless it was a win. It took eight years of hard work, sweat, tears, and a fair amount of bashing by critics, but Jordan had finally won a race. Even the talks of Jordan team-orders at the end of the race, and God Save The Queen being played on the podium instead of the Irish National Anthem – Amhrán na bhFiann, failed to make a dent on Jordan’s elation. Jordan went on to take three more wins – two the following year and the fourth and final win at the 2003 Brazilian Grand Prix. In 2004, Eddie Jordan sold to Midland who retained the Jordan name for 2005 before re-branding as Midland F1 Racing for 2006 then to Spyker for 2007 before eventually selling out to Vijay Mallya who rose Force India from Jordan’s ashes.